Hailing from Denver, Colorado, this three-piece band fuses real-life with a sense of humor. A power-pop/punk band, their focus is fun, not depression or political tension. Every song has that certain line, phrase, or the whole song that you can sit back and go, "Yeah, I know what they mean. Me too!" On their debut EP, they serve up seven tracks in a time span of twenty-five minutes. "Under The Seat" starts the album off with a power-pop number that is also deeply rooted in punk. 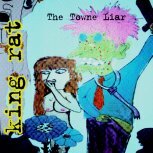 A song about being pulled over by cops, this is one of those subjects that really bothers some people, while other people just shrug it off, much like King Rat, because they've got "Nothing to hide." The guitar is thick, very punk-ish, and drives all the way through the song without hesitation. The drums are the center piece for the song, banging and hammering away in the background with perfect time. Throw in some juicy bass and some punk growls, and you have a catchy number that will get you singing along and having fun. Then we come to "21," the stand out track on this album. Ever wondered what will happen to you when you're 31, 41, or even 81? Taking a stab at their fears, imaginations, and just plain poking fun at the future, King Rat serves up a very Ramones-ish pop-punk number that will have you bouncing along and singing with each word in no time. Very catchy, upbeat, and one of those songs that just gets you on the floor laughing crazily, this song has all the right components to get you enjoying it within the first ten seconds. From the first hook they slide your way until the last breath of air they breathe, you'll be listening to this song intensely. A theme song for the youth of today? A theme song for the kid inside everyone? It doesn't matter what the song means to you, just kick back and enjoy it. Keeping the punk momentum, "Pastime" seems to call a lot more on rock influences than their catchy pop-punk ones. Their longest song, clocking in at four minutes and twenty four seconds, it just seems to drag on and doesn't have the hooks and catchy lyrics of other material. On the other hand, "Alone Star" seems to call upon their straight ahead punk influences, also ignoring the poppier side of the band. Fast and furious, it still has the band's power but seems to lose the ability to pass on fun and excitement to the listener. A good song to just release all your tensions with, it's just not as fun as the other tracks. For only seven songs, this EP really grabs your attention. A great CD to just put on and have some fun with, you won't be frowning after you hear this one. I'll give it a B.